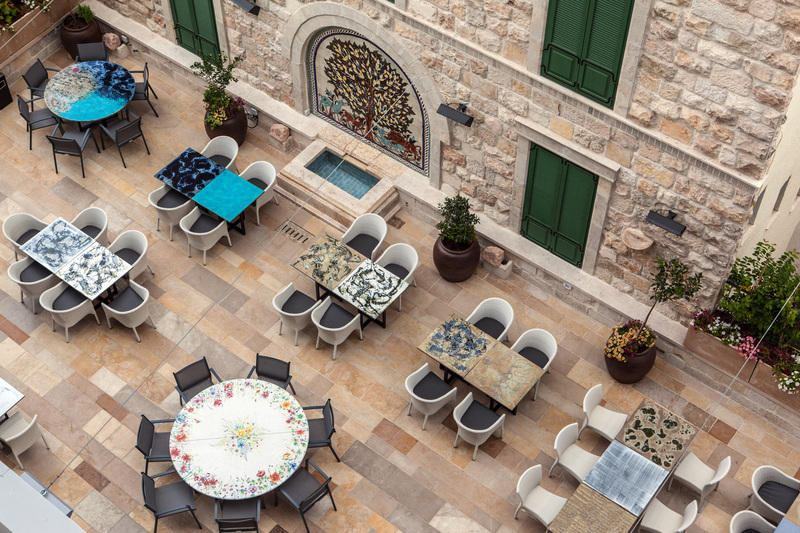 In the heart of Nazareth lies the Legacy Hotel, designed uniquely to provide guests with a multi-sensory experience of the city, while instilling the magical atmosphere of the market in Nazareth, in all its diversity- aromas, colors, flavors and sounds. The Legacy Hotel is strategically located just a short walking distance from the famous Basilica of the Annunciation and the lively colorful market. It also allows easy access to other tourist sites such as Mount Precipice and Mary's Well, among others in the Galilee region. The hotel offers 100 spacious rooms and suites (spread over five floors), designed for maximum comfort and convenience of guests. Fine artwork is displayed throughout, representing the history and heritage of Nazareth. Keeping guests in mind, the hotel provides the opportunity to relax in several lounging areas, such as the spacious lobby, the beautiful bar and the breathtaking Patio ,decorated with special Armenian wall art. The open kitchen dining room, which is designed as a colorful market, offers an Israeli culinary experience and is guaranteed to leave you with an appetite for more. Guests can also enjoy fine cuisine in the hotel's boutique "Oud" restaurant, conducted by international chef, Johnny Goric. Hotel services include a modern and fully equipped gym, which is open to hotel guests 24 hous a day. Avenue of convenience stores and fashion, indoor parking and concierge services.